Summer is here!! Time for long evenings watching the waning rays of sun disappear behind shadowed evergreens, enjoying a cocktail as the day slips away. Family, friends, cookouts and s’mores! It is no secret that I love s’mores. But sometimes, I want the flavor without having to fire up the flames. I love this easy dessert because I can make a batch and keep these delightful cups stashed in the freezer for when the chocolate graham cravings hit. I put these babies in individual baggies so they are all ready for me to eat up (usually around midnight). 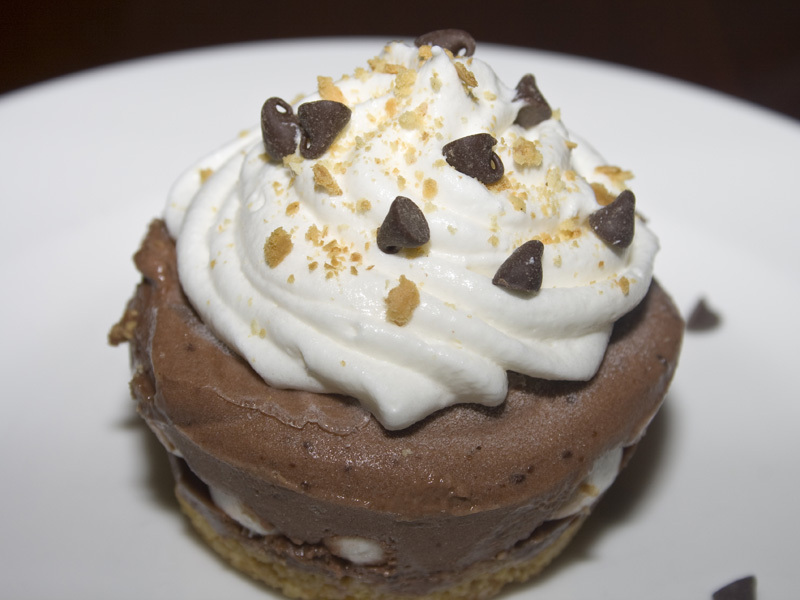 They are sweet and cold with perfect layers of graham, chocolate, mallow and more chocolate. 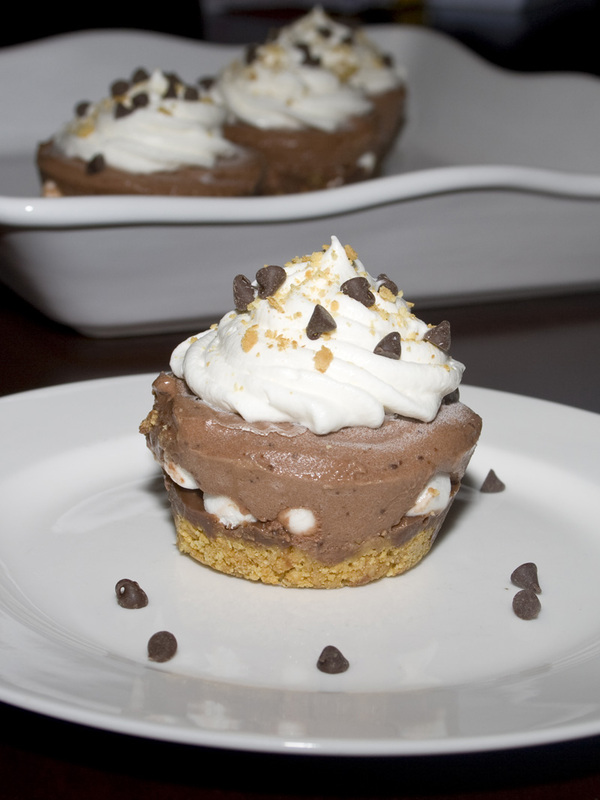 Topped with a cool and creamy hit of cream! 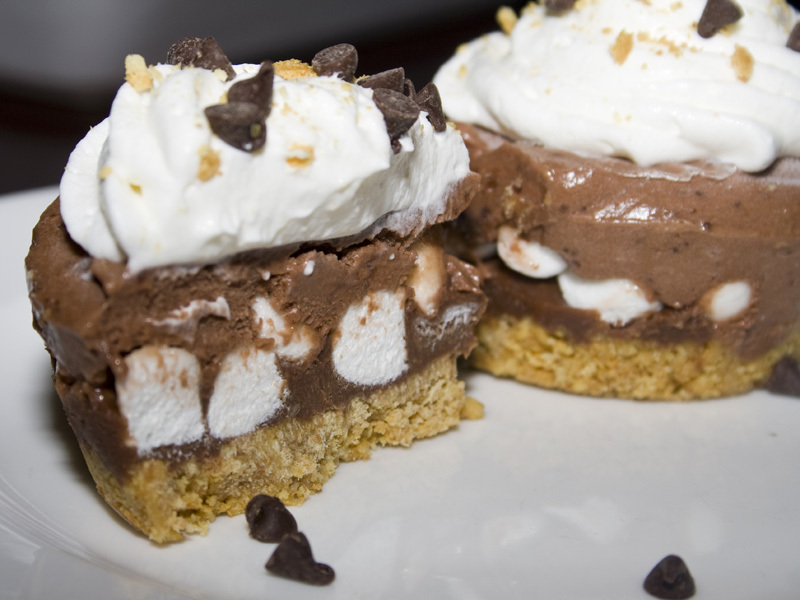 If you like s’mores, you will LOVE these. They are lip smacking good. I topped mine with a little graham sprinkle and some mini chocolate chips. Gorgeous! You may have to devour more than one! And there’s nothing wrong with that! Crush graham crackers into fine crumbs. Melt butter and add to graham crackers, mixing until well combined to make crust. Prepare muffin pan by spraying it with non-stick cooking spray. Evenly divide crust mixture into all 12 cups, saving about 1/4 cup to use as topping later. Place milk chocolate chips and whipping cream into a small bowl and microwave in 30 second increments, stirring in between, until melted and smooth. Spoon chocolate into a zip top bag, cut a tip off and evenly pipe chocolate into the center of each cup, on top of the crust. Mix cold milk with pudding on medium speed for 2 minutes. Fold in 1/2 of the Cool Whip container (the rest will be used as topping). Spoon filling into a large zip top bag (and ZIP it or you might have a mess!) Clip a corner off and pipe pudding into each cup evenly. Try to pipe it in between the marshmallows so that the whole cup is filled. I did have a little left over (which was really tasty straight out of the bag!) Use a knife to smooth the tops level with the top of the pan. Freeze for at least a couple of hours. Allow the pan to warm just a bit before running a butter knife around the edge and popping out each dessert cup out. 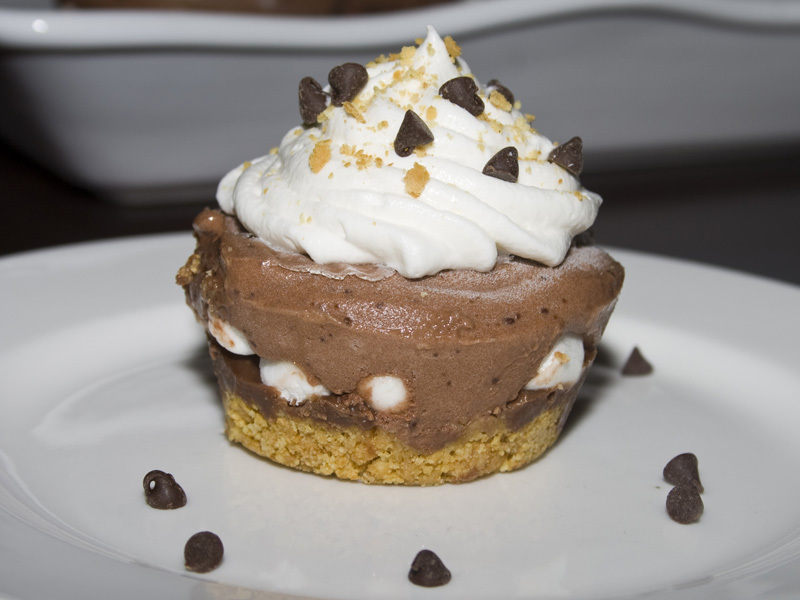 For topping, I just piped a little bit of the left over Cool Whip on each dessert using a decorating tip. Then I sprinkled the remaining crust and mini chocolate chips on top. Serve cold right away– or put them in a sealed container and freeze until you are ready to serve. No, this isn’t a “real” recipe. Just something I want to share with you all since campfire season is upon us. 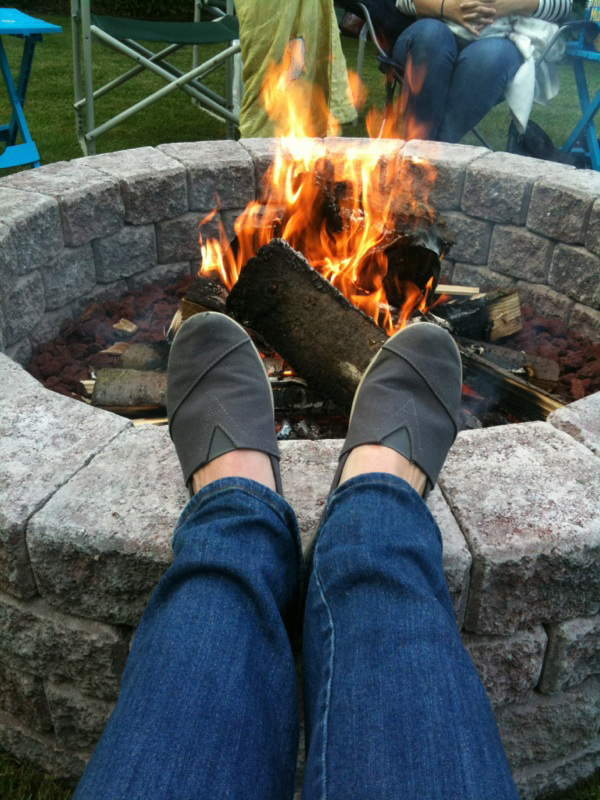 And that means kicking back listening to the crackle of wood burning and being mesmerized by logs turning to coals. I have to give a shout out to my amazing father. The beautiful stone fire pit you see in the background? Yeah, he built it. He threw it together this afternoon for my mom so all us kids could come over for a campfire this evening. I’m not kidding. He’s so awesome. 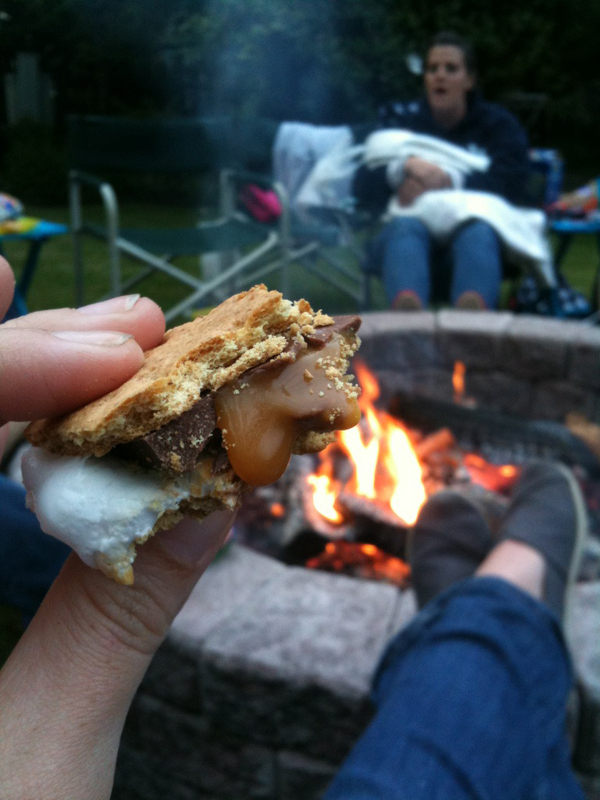 When the embers are just perfect, it is time to make s’mores. Classic campfire food. 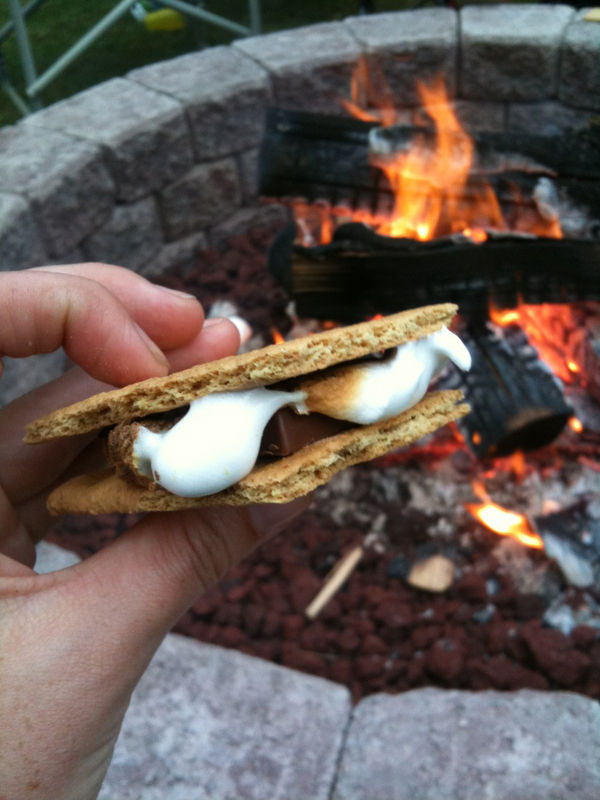 Did you know s’mores are not required to have plain chocolate on them. No, there’s a world of other possibilities for making gooey, melty marshmallow goodness. My favorite is using Ghirardellis caramel squares instead of regular old Hershey bars. First of all, it’s better chocolate. Second, it’s filled with gorgeous oozing caramel. It is amazing. Try it at your next campfire. You’ll never go back! 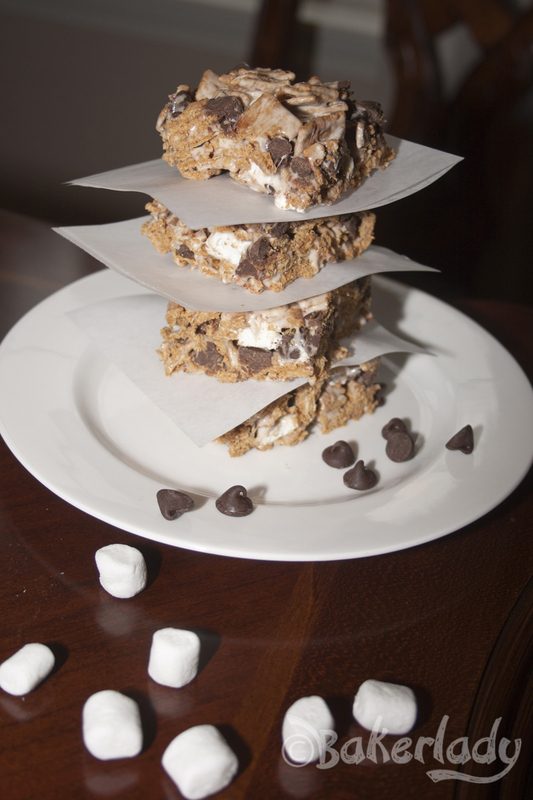 Do you have a go-to chocolate replacement in your s’mores? First, you take the graham. You put the chocolate (caramel square) on the graham. Then, you toast the mallow. Onto the chocolate it goes, top with another graham and mmmmmmmmm, enjoy. Baseball equals s’mores. Bear with me. I swear my thoughts make logical sense in my head. I’ll try to help you keep up. Today, I went outside because I saw a bright yellow orb in the sky. I had to find out what it was. The sun! Fantastic! 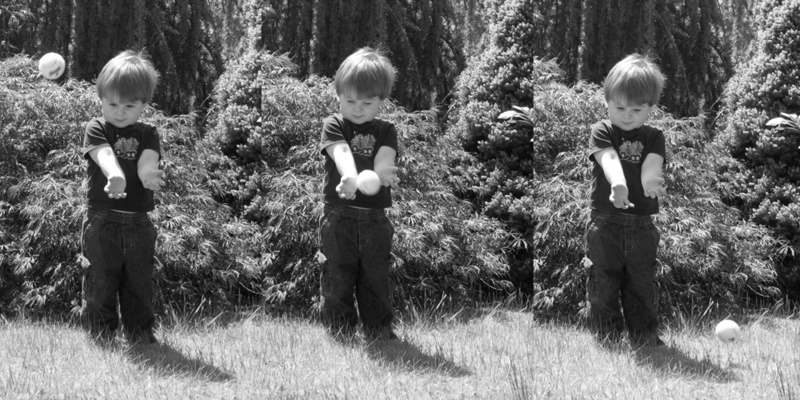 My husband used the opportunity to teach our son how to catch a ball. Thankfully, Zack is wise enough to start with a tennis ball instead of a baseball. Donovan need a little work on keeping his eye on the ball.